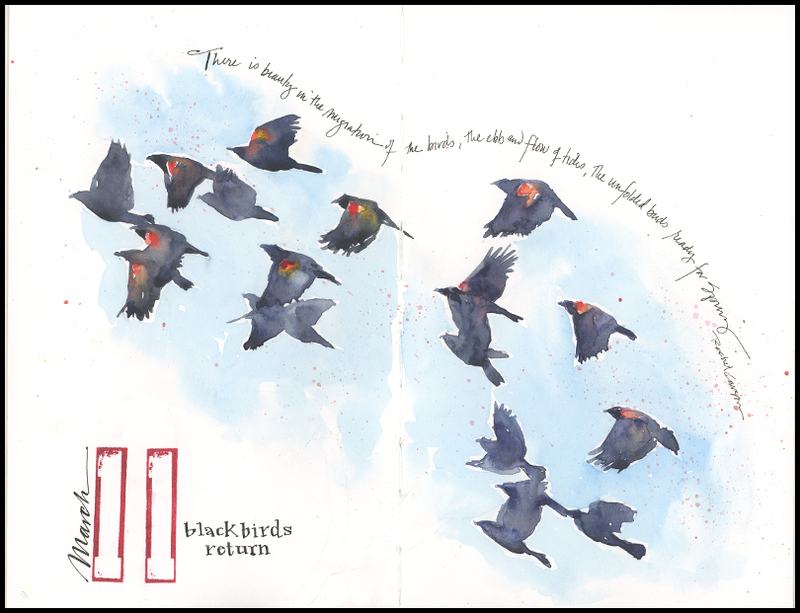 Sometimes it’s February, sometimes March when the red-winged blackbirds return. Regardless, it’s a welcome and exuberant racket of wingbeats and squawking from the marshes and treetops. It doesn’t necessarily mean that spring is here; indeed, today, a flock swarmed over our yard and flew off just as it began to snow. But it means we’ve turned the corner: more light, more days above freezing than below, and more good things to come. Tips and Techniques– I wanted to zoom in on the shapes of the birds in flight, rather than the details, and let some of the birds merge, the way they do in a flock. To do this, I used a loose wash of ultramarine and burnt sienna to create the black, and tried to drop in a bit of yellow and red before the birds got too dry. I like the way the red merged into the dark mix, creating a dusky purple on some of the wings. I suspect this would work better at a larger size, where you could really get some nice color variation and more mixing right on the paper. Subzero temperatures mean I’m inside, but birds are out in force at our feeders. They start at dawn and come and go or stay all day, eating as much as they can to fuel their survival against the cold. 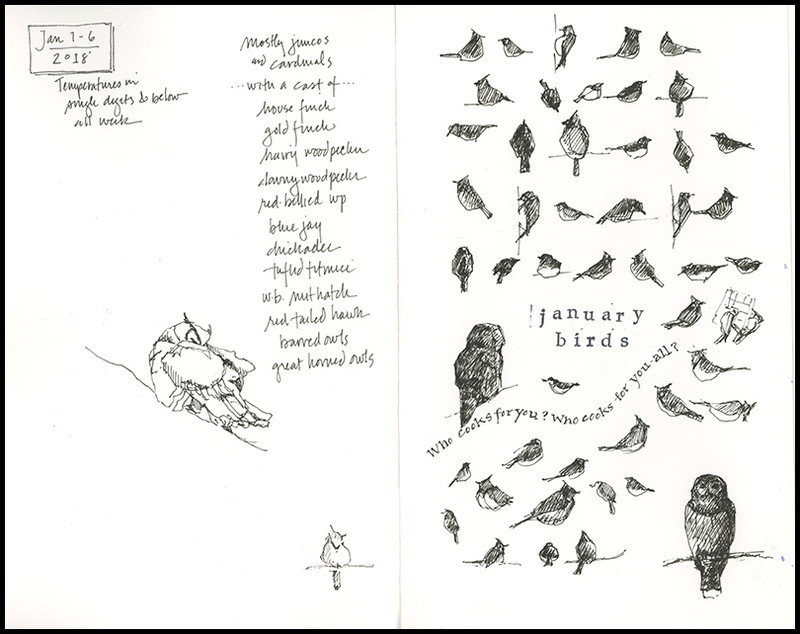 With this abundance of subjects, I have been focused on capturing bird shapes and postures with small, quick ink sketches. The beauty of this exercise is that you don’t invest in any one bird, you are simply training your eyes and hands to work together. My second focus for the week has been owls, which I have not drawn much before. Barred owls have been calling in the stream-side woods next to our house for weeks. And we caught sight of a great horned owl nabbing a meal (likely a squirrel) near our feeders at dusk. Owls mate in January and February, so I expect to hear more activity in the coming weeks. 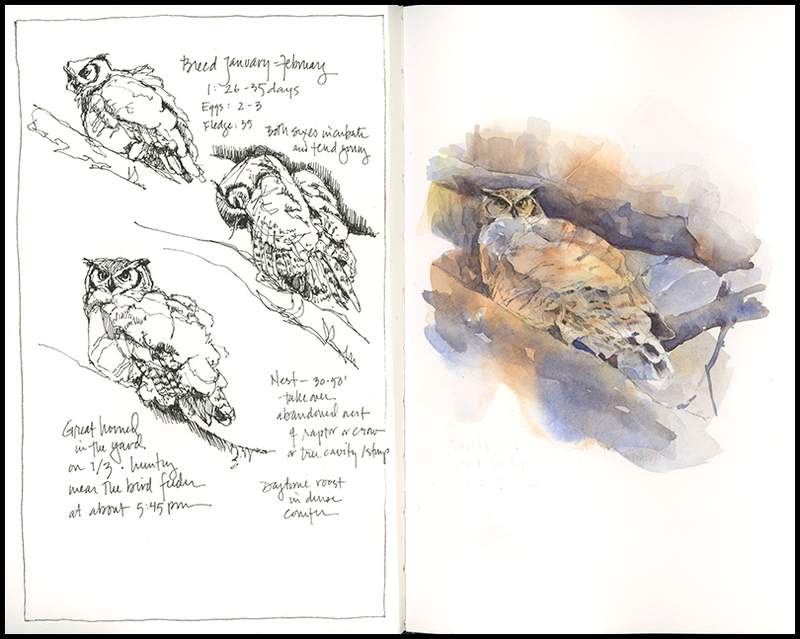 Tips and Techniques: I drew the owls from videos, which I tend to like because they convey a bird’s personality and movement better than still photos, yet you can pause and replay if needed. Try drawing directly in ink and not worrying whether you get everything right. Keep your eyes on the bird more than your paper and keep your pen moving. The painted owl is a small study I wanted to try to help me decide whether to do a larger painting. The proportions aren’t quite right, but the negative painting technique worked more or less as I had hoped.